Brethren and guests of Lodge of Equity and Appleton No 1384, met in the McCausland Suite at Widnes Masonic Hall to welcome a new member into Masonry. Ian Edge (left) congratulates Elliott Dennett. Elliott Oliver Dennett was proposed by his cousin, the WM Ian Edge, after his interest was stimulated into joining Freemasonry when watching the Sky1 series ‘Inside the Freemasons’. Before the lodge was opened, Ian Edge welcomed the visitors, which included the Widnes Group Chairman and vice chairman, Neil Pedder and John Gibbon respectively. 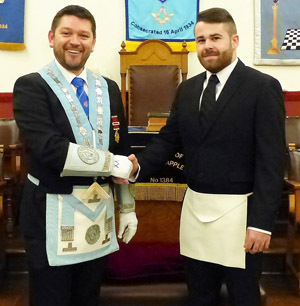 Ian then opened the lodge and after completing the normal business of the lodge, the treasurer who had attended on the candidate, entered the lodge to confirm that Elliott had signed the book of declaration and paid the necessary fees. The candidate had been prepared by the tyler Andy Maginn and the inner guard Joe McLean, challenged Elliott on entering the lodge. He was then guided through the ceremony by the junior deacon Geoff Enright, assisted by the senior deacon Peter Carter. Ian carried out an excellent ceremony and was ably assisted by IPM Derek Williams who delivered the charge at the north east corner of the lodge. The working tools were explained by the junior warden David Penney. The charge after initiation was delivered with sincerity by the chaplain Bob Winch. When the ceremony of initiation was concluded, Ian welcomed brother Elliot into Lodge of Equity and Appleton and presented him with the book of constitutions, bye laws and a welcome pack from the group. The lodge was then closed in due form with the brethren then retiring to the festive board in the Peter W Browne Suite to enjoy a fine meal and good company. At the festive board a raffle was held which raised £60. There was also a draw for the annual lodge raffle which raised £150, with the three prizes being won by Derek Parker, Mike Burwin and Stuart Parker. Pictured from left to right, are: John Gibbon, Ian Lynch, Ian Edge, Elliott Dennett, David Penney and Neil Pedder.